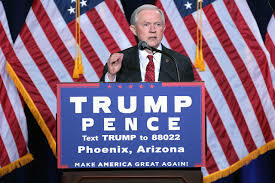 Attorney General Jeff Sessions is considering scrapping Obama-era rules that banned harsh punishments for low-level drug crimes and could direct prosecutors to resume charging severe penalties, according to U.S. officials who spoke to the Washington Post on Tuesday. The change would overturn a 2013 memo by former Attorney General Eric Holder that instructed prosecutors to avoid issuing charges that would trigger mandatory minimum sentences for low-level defendants. If the new instructions are implemented, it will mark another major pivot by the Trump administration away from recent federal efforts to address mass incarceration, which is now widely seen as ineffective and harmful. It’s also less than surprising. Prior to Sessions’ confirmation in February, the Brennan Center for Justice released two analyses warning that the former Alabama senator could upend all the progress the Justice Department has made in addressing everything from prison reform to voting rights. “Sessions appears to subscribe to outdated ideas about criminal justice policy that conservatives, progressives, and law enforcement leaders agree do not help reduce crime,” Ames C. Grawert, counsel in the Brennan Center’s Justice Program, said at the time. Indeed, while serving as district attorney from 1981-1993, 40 percent of Sessions’ convictions were for drug charges, double the rate of other state prosecutors. He is also known to be against marijuana legalization, an issue that has gained public support in recent years, and has a history of favoring “tough on crime” policies, including blocking limits on the use of juvenile solitary confinement.